We specialize in Maternity care during all stages of pregnancy. We have both the training & experience to safely and comfortably provide chiropractic care to pregnant women. We enjoy referrals from local OBGyns & midwives. Chiropractic is a drug-free way to address the back pain and sciatica commonly associated with pregnancy. Most women report less fatigue, better sleep, and easier movement as the spine aligns and the neurological dysfunction is reduced. 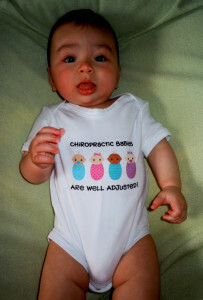 Adjustments have been known to allow a breech baby to turn on its own (this is known as the Webster Technique, and both doctors are Webster Certified). "With my most recent pregnancy, I was determined to be more comfortable and functional, physically speaking. My babies have been big, the first was a boy at 8 lbs 11 oz and the second boy came in at 9 lbs 10 oz, and they've both sat quite low on my body. Needless to say, my back needed some help and my nerves needed some relief from the sciatica (leg pain from pressure on the nerves) that plagued my first pregnancy. The sciatica from the first baby was so unbearable that I remember it being nearly impossible to find a position that didn't result in a sharp pain in both legs. However, my most recent pregnancy was different. Starting at about 3 months into the pregnancy, I saw Dr. Sloane. She was very conscientious about the pregnancy and worked with me up until the week of my delivery. I never felt uncomfortable and could trust her expertise. Even during the last week of pregnancy, I was feeling better and more active than I was at the midpoint of my first. I enjoyed the extra mobility, better sleep, and overall well feeling that chiropractic provided during those months of rapid bodily expansion and rearrangement. I would recommend it for anyone who wants to physically enjoy their entire pregnancy, from the first to the last trimester." - Sarah D.
Your feet are the foundation of your body, supporting you when you stand, walk, or run. Even if your feet don't hurt, they may be contributing to your leg, hip, back, or neck pain. Chiropractic adjustments can not work as well or last as long if every step is throwing you out of alignment. If you have low arches, extremely high arches, wear your shoes out excessively or enevenly, or have one leg shorter than the other, you will not get as well without foot support. We offer pre-fabricated and custom-made orthotics. Call for a complimentary foot scan to see if the solution to your pain may be just 2 feet away. As part of our goal to provide safe, natural, holistic care for entire families, Dr. Eusebio completed post-graduate course work in 2009 and earned the designation Certified Chiropractic Wellness Practitioner (CCWP). This program, along with other post-graduate work in nutrition and wellness over the past 10 years, is the basis for the wellness coaching led by Dr. Eusebio. The wellness coaching provides evidence-based information in nutrition, genetics, natural health, physical fitness, spinal hygiene, and state of mind/emotional health. Unlike most wellness programs, ours also offers crucial insights and techniques for generating and supporting the patient lifestyle changes we teach.